Background. I have been exploring the inaugural release of Medicare prescription drug utilization since its publication last spring. (We should get the numbers from calendar year 2014 in the next few months, but I have Medicaid 2014 in-hand and up-next!). The database does not include all Medicare beneficiaries, only those in Medicare Managed Care or in Medicare Part-D Drug plans, but that makes up a majority of bebefuicuarues. The proportions vary from state to state, but the Medicare programs covers eligible individuals over the age of 65, and some individuals who have been certified as disabled. There is a sizable proportion of individuals who are eligible for both Medicare and Medicaid for other reasons. I frankly do not at present have a good handle on the numbers of beneficiaries in these and other categories that may be included within the present data. 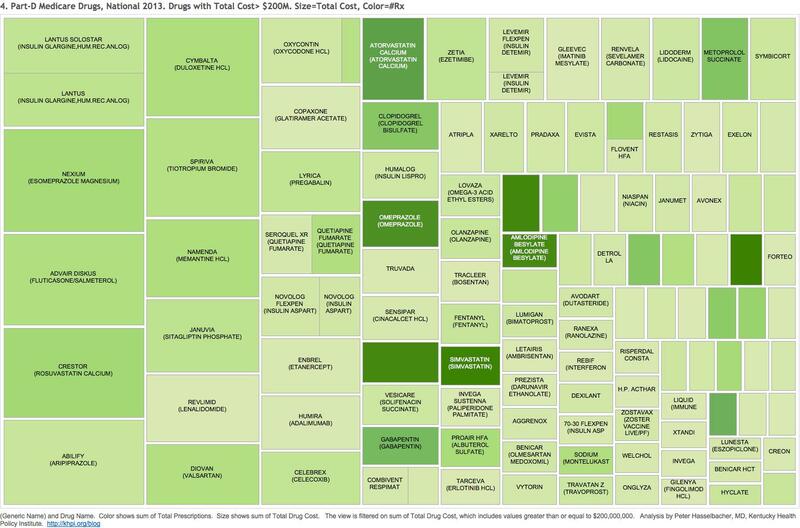 Figure 1 and interactive online graphic Tab 1 present a TreeMap of all 3447 discrete drug products prescribed to these patients . The drugs comprise #14 billion prescriptions costing an aggregate of $103 billion paid by Medicare, other third-party payers, and by patients. Each rectangle in the chart tallies all forms of the underlying chemical ingredient and is further subdivided into generic and branded preparations. Some cells are filled nearly entirely with generic versions of a given drug drug such as the opioid combination hydrocodone/acetaminophen or the anti-acid drug omeprazole. For other cells in 2013, only a brand name was available such as the purple anti-acid pill Nexium, the cholesterol drug Crestor, or the asthma/COPD drug Advair. It is easy to spot which drugs have no generic competition because they are shaded a darker green indicating a high total cost to the body medical. As we have seen, some 50-60 drugs make up more than half of the total prescriptions written and dispensed. At least 5 of these are opioids or opioid adjuvants subject to abuse – over 6% of all Medicare prescriptions right there! Three of the big-kahuna drugs (that I recognize) are for heartburn or symptoms of esophageal acid-reflux. There are too many sleeping pills or tranquilizers – certainly so for oldsters like me. I still can’t believe so many people are taking thyroid hormone—it’s the number one prescribed drug. If you can’t afford it, it doesn’t exist for you. Figure 2 and online Tab 2 depict on the Total Cost of a given drug or branded product. The larger the cell or subdivision, the higher the total cost. For the most part, brand names take home the lions share of the 50-60 highest cost products. For some of these it is because they had no competition in 2013 such as Crestor, Nexium, Abilify, Spiriva, Colcrys, or Lyrica. Perhaps some of such brand name products offered a unique advantage that made the expenditure justifiable. In my own head, and based on what I can learn, I wonder if some brand name drugs are doing well for their makers largely because of the success of their marketing rather than any clear clinical advantage. For example, I am unaware of any clinical advantage of Nexium, the second costliest drug, over the well-tested and relatively inexpensive generic omeprazole. If all the prescribed Nexium had been paid for at the price of omeprazole, the public would have saved $2.4 Billion. Why does this not seem to bother anyone else enough to do something about it? Let’s hear from an expert not on the payroll who is willing to justify the expense? A generic version of Nexium is now available, and in a rational world the demand for brand name Nexium would fade away. However, its manufacturer is systematically currently urging patients to ask their doctors to resist writing for the generic form. We shall see what happens. Figure 4 shows the same cost numbers for drugs with a Total Cost greater than $250 million. It is one thing to pay extra when you do not think you have any option, but how can it be justifiable to pay for a brand name drug when a perfectly acceptable generic alternative is already available? I have already written about my favorite drug, L-Thyroxine, which literally rescued my life. Mousing over Tabs 1 and 2 online easily identifies common and expensive drugs for which a generic form is available. For example, there are generic versions of Cymbalta, Synthroid, Seroquel SR, Lipitor, Vicodin, Diovan, Aricept, Lanoxin, and many many others. I will be the first to admit that I have never heard of, let alone used most of the drugs on this list. There may be intricacies related to the different preparations that are unknown to me. A generic version might not have even have been available for the entire year 2013. However, I can express an expert professional opinion that there is no meaningful advantage to taking the brand name non-steroidal anti-inflammatory drug Voltarin over its generic form diclofenac sodium. The fact that over 2 million prescriptions were written for Voltarin cost Medicare and its beneficiaries almost $100 million dollars more than necessary. Making the river flow backwards. There is a new wrinkle in brand name to generic conversions, and that is the reverse phenomena, from generic to brand name with subsequent sky-rocketing of price! The first I encountered this rip-off was with methotrexate in the 1990s. Generic methotrexate is a older drug used for cancer that proved to be the first drug than made any real difference in rheumatoid arthritis. Even better, it was generic, taken by mouth, and available in the smaller “pediatric” doses that we needed for arthritis. The icing on the cake was that it was the cheapest effective medicine available for that disease! When it was shown- not by industry research- that the drug represented a breakthrough, the company abandoned its generic pills, renamed, and repackaged methotrexate, and jacked the price up to make it one of the most expensive! We rheumatologists protested ineffectively. Ironically, administering high-priced drugs eventually turned rheumatology from one of the poorest paying medical specialties into one of the highest! The hijacking of generic drugs was a prominent news item this year when Martin Shkreli cornered the market on a standard anti-parasitic drug, pyrimethamine, and increased its price from $13.50 a tablet to $750– raising the question of what parasite needed to be treated the most. As it happens, Mr. Shkreli was subsequently arrested on other business charges but I do not know what happened to the price of pyrimethamine since. Charging desperate people for more than their personal net worth is apparently the new standard for the pharmaceutical industry. We, though our elected officials, have given our approval to the strategy. 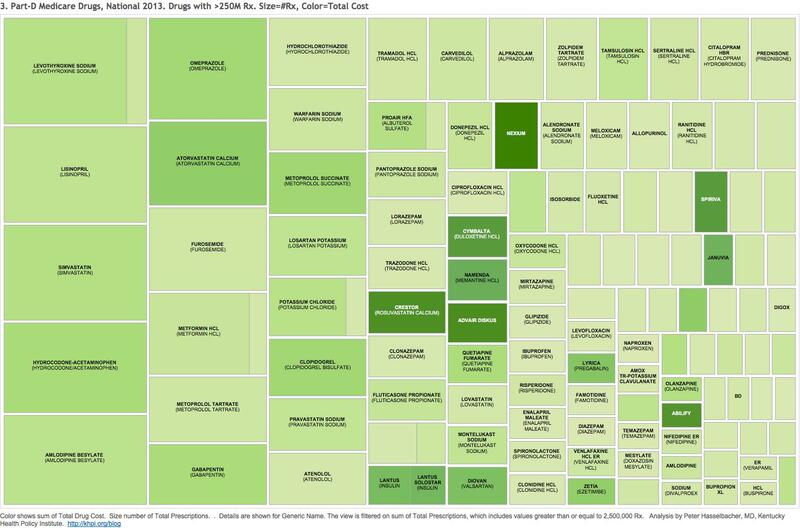 I was reminded of generic-to-brand conversion when I noted that Colcris, and not colchicine, was present in the TreeMap to the tune of 1.4 million prescriptions, $281 million dollars, at $203 per prescription. As it happens, colchicine is one of the very oldest known drugs in recorded history. It was mentioned by Hippocrates who employed many other untested remedies that survived for centuries in that therapeutic limbo. It has been used to treat acute gout (a form of arthritis), and then in more recent times, to prevent future attacks. It was highly toxic, only modestly effective, but cheap. When truly effective treatments for both acute and chronic gout came into use, colchicine fell into the background with limited indications. Nonetheless in a move that must have caught Mr. Shkreli’s attention, one company took control of the product and jacked its price up such that for Medicare, Colcris is the 195th most prescribed outpatient drug and the 87th most costly of all several thousands of drugs. To my knowledge colchicine as a generic drug is no longer available in this country. Flaming this remarkable result is a flood of marketing through the “Continuing Medical Education” network focusing on the treatment of gout. You should assume that these three examples above represent only the smallest tip of the smallest iceberg of creative drug marketing. Which tweaks of a product add real value? In my opinion, there is not a lot of clinical judgement needed to substitute a generic drug for a brand name, at least for the kind of chemicals that make up the majority of existing drugs. Both classes have to pass Federal Food and Drug manufacturing standards. There are enough watchers of the process that my default inclination has always been to use generics when able. I am sure that some reader will be able to point out an example of a batch of a generic that failed to pass muster, but the same can be said about a host of brand names. Recalls happen all the time for both foreign-made and hometown drugs. I would like to think that if there was a meaningful difference between generic and brand name versions that my professional colleagues would shout it from the rooftops. I concede that the effects of some marketed drugs are so meager that only a statistician would be able to tell the difference in the first place. In that case, I have to ask why we are paying for that particular drug in the first place! However, many if not most of the alternatives to a regular generic version do not involve the active ingredient of the product. Such tweaks are often introduced as a strategy to maintain market share and to delay losing patent protection all at once. It is not possible to make a blanket statement that all such modifications of a given drug are without value. For example, for short-acting drugs it may be useful to have a slow-release formulation available to keep levels in the blood up or to avoid having to take as many pills in a day. For other drugs this would not be an issue. For some drugs and patients, a long-acting preparation might actually be harmful. (For example, some Medicare patients in this database are receiving long-acting sleeping pills. Not usually a good idea!) Some drugs,, like the opioids Opana and OxyContin, are sold as relatively tamper-resistant versions of their ingredients. Some alternatives are liquid, gel, or powder versions of the parent drug. Drugs are marketed as combination pills with other active ingredients, largely for convenience. (In general, combinations are to be discouraged. There needs to be a good reason to commit a given patient to fixed strengths of drugs. There are other downsides to combination drugs. For example, the incorporation of acetaminophen (Tylenol) in many other drugs has led to fatal overdoses of acetaminophen.) Of course, there are generic versions of many of the modifications above at much less expensive cost. For the distinctions as suggested above, clinical judgement plays an important role. One may fairly ask if we physicians and other prescribers are stepping up to the plate on our patients’ behalf. Do we need an umpire? I would like to think not. Nonetheless, I fear that the procured benefits of all the heavily-marketed bell-and-whistle additions to basic generic drugs are not worth the often huge increases in their costs. I believe that a little more judicious application of clinical judgement would lead to much more efficient and cost effective medicine. This is not to say it would be easy. Value judgements are always present. For example, the single costliest drug for Medicare patients overall is Lantus, a manmade, genetically engineered human insulin costing us $2.5 Billion. It comes in two versions– one as a classic solution presumably in a little bottle that requires the use of additional insulin syringes; and Lantus Solostar which is packaged in/with a self-administering injector. The two forms are being dispensed in nearly the same amounts but I do not know if using the Solostar version requires more individual prescriptions per patient. Self-injecting “pens” are especially useful for patients with limited vision, impaired manual dexterity, or limited cognitive abilities. The simple solution-in-a-bottle costs $285 per claim, and the second $355. Few would deny the value of making it easier or more reliable for people who need extra help. However, where and how do we make the distinctions between medically necessary, medically defensible, and patient convenience – and does it make a difference who is paying the bill? This whole example begs the fact that there are other and less expensive forms of human insulin available. Every drug in these lists list can be looked at, indeed should be looked at through these same lenses. The final Tab 5 and Tab 6 associated to today’s project allow experts and the public alike to browse though the underlying data. Tab 5 Is an overlong bar graph of Total Cost for each prescribed drug presented in descending order of the Total Cost for the underlying parent drug. Is it broken out for each generic or brand name version. The bars are labeled with cost per prescription – what Medicare calls cost per claim. I invite the viewer to scroll down for a few pages to get a sense of the variation among products. Of course its not just about the money spent, but the truism that medical resources saved in one place can be put to good use elsewhere. Surely there is no end to that need. 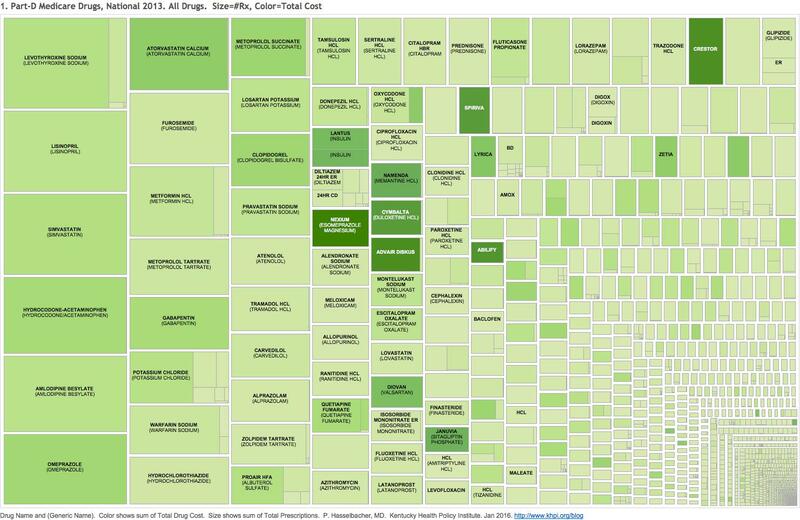 My next look at drugs will be at Medicaid utilization and expenditures in Kentucky, 2014. Wait till you see what the newest high-cost drugs for hepatitis and drugs used to treat opioid drug addiction are doing to our budget! I agree with Governor Bevin that Medicaid is unsustainable, but no more or less so than any other segment of our fragmented system of health care – private or public. Better to grapple with the giants, to the advantage of all, rather than cast the disadvantaged to the wolves. As always, if I have made an error in fact, please help me correct it. There is lots of room for inadvertent error in these masses of data. 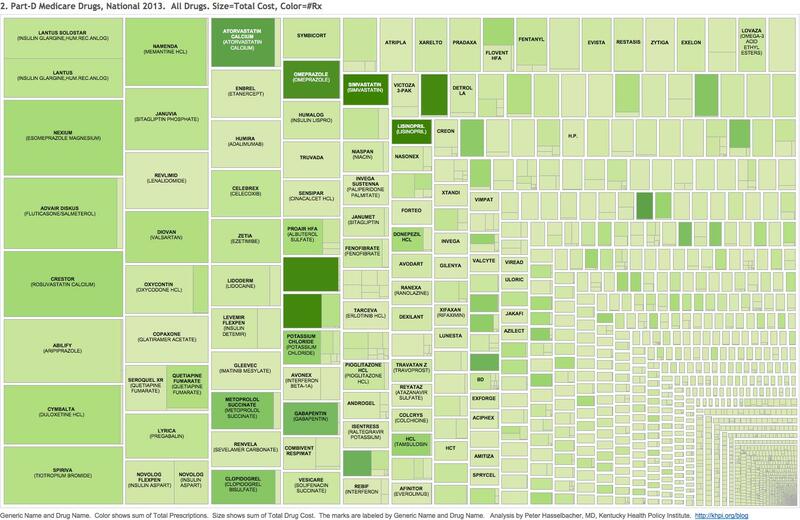 Previous Previous post: A Different Look At Drug Prescribing in Kentucky.